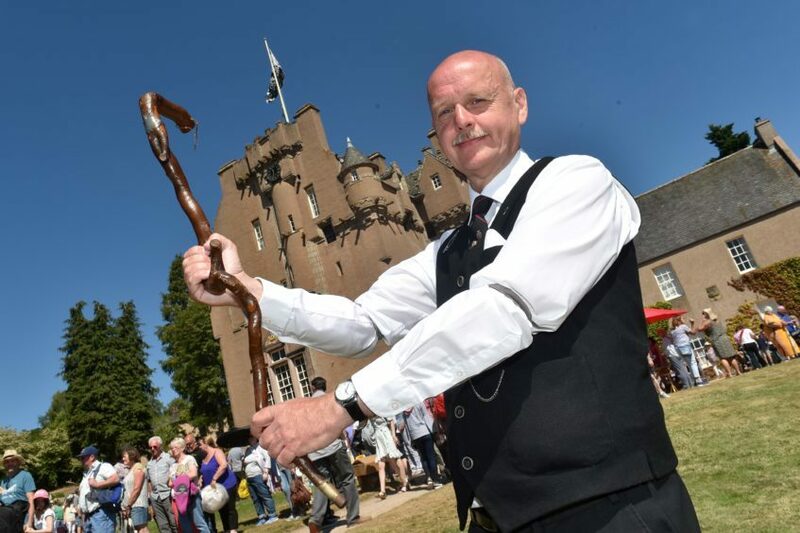 And, as the sun shone on Deeside, collectors and curio-hunters in their thousands flocked to Crathes Castle yesterday clutching their precious treasures and waiting to speak to experts as filming began on the BBC’s Antiques Road Show. Almost 4,000 people queued to have their bundles and bags evaluated – with only around 40 being picked to be filmed for the two episodes being produced. One Jacobean drinking vessel very nearly did not make it to the glassware table, because the handle of the bag it was being carried in snapped, sending the contents crashing to the ground. Road Show presenter Fiona Bruce, whose family originally hails from Moray, said she wouldn’t expect any such finds within her own attic. She added: “My grandparents were Hopeman fishing folk – we don’t have any treasures. Now in its 41st year of production, the Road Show is the BBC’s largest outdoor filming crew, with the exception of the BBC 6 Music live concerts. John Stephen was filmed talking about his vast collection of Wemyss pottery, which includes several of the famous pigs, some of which only have 16 in the world remaining and are collected by such celebrities as Elton John. After making the trip to Crathes from Edinburgh, Carol and Michael Robinson said they had wanted to come along with their items as part of their holiday. Mr Robinson added: “It’s not at all like seeing it on the telly – I thought they would have other experts to deal with the majority of the queues. Owner of Braemar’s Pre-Loved shop, Karen Hampson brought along a Steel Yard Weight on behalf of a customer. Fans of the TV show keen to see how the items brought to Crathes fared will have to wait a few months. It’s understood the BBC intends to air two episodes on the visit but the first is unlikely to be shown before Christmas. The second would follow later in 2019. As the patron for the Gurkhas in the north east, Graham Guyan from Aberdeen brought along a walking stick which belonged to the late Sir Harry Lauder. Once the highest-paid performer in the world, he was also the first British artist to sell over a million records. Graham Guyan with Harry Lauder’s walking stick.<br />Picture by Colin Rennie. His career peaked between 1900 and 1920 and his crooked walking cane was famously used as his signature prop. The Corkscrew Hazel ornamental is sometimes known as Harry Lauder’s Walking Stick, in reference to the crooked walking stick which was often carried by the entertainer. He starred in three films and wrote music hall tunes including I Love a Lassie and The End of the Road, which he composed in memory of his son who was killed during the Second World War. Mr Guyan said it had been in his late wife’s family and that he “would never” sell it.